A GROUP of local campaigners who are striving to make the world famous Lerwick Up Helly Aa festival more inclusive by allowing women and girls to participate as squad members are considering their next steps after hitting a wall of silence from the organisers of both the junior and adult festivals. Shetland for UHA Equality said several attempts to engage with the organisers of the fire festival received no response and not even an acknowledgement. An application by four girls to form a squad for the 2019 Junior Up Helly Aa (JUHA) was rejected by the committee organising the event. A reply from the committee made it clear that no girls would be accepted in squads in 2019. When contacted by Shetland News both organisations declined an invitation for interview. The equality campaigners also question the association Lerwick schools have with several aspects of the festival, as well as the fact the Shetland Islands Council hosts a reception for an event that – in their view – does not promote equality of choice. In response, council convener Malcolm Bell and chief executive Maggie Sandison both defended the local authority’s involvement and put forward the view that Up Helly Aa would change if the community wants it to. In addition, Sandison expressed grave concern at the polarised nature of the debate, and warned that this “creates an environment where people go silent through fear”. Karrol Scott, one of seven members of the campaign group Shetland News met with in February, said girls and women should be able to have an active role in the procession if they want to do so. “I believe it is well past the time now to open this up to girls and women, and I can’t believe it hasn’t been done sooner,” she said. The Shetland for UHA Equality group was formed in January 2018 and it currently has just above 100 members who communicate in a closed Facebook group. One of the organisers, Sally Huband, said while it was regrettable the group was not able to be more open, members had to protect themselves due to the verbal abuse – both online and in person – that has been directed at some of the people who have spoken out in favour of a more inclusive Up Helly Aa. See here the responses to Johan Adamson’s short letter ‘Unauthorised absence’ Shetland News published on 25 January. Many of those campaigning for equality in all aspects of all Up Helly Aas have themselves a strong connection with the festival, both in Lerwick and in rural areas of Shetland. Scott said her first UHA experience had been at the Girlsta and Nesting event in the 1990s shortly after she had moved to the islands. She said she had a fantastic time and experienced the festival as a great way of getting to know the community. “It wasn’t until years later when I moved into Lerwick that I started to understand how women and girls were excluded from the main procession,” she said. Group members insisted that they don’t hate UHA – quite the opposite in fact – but they feel it is high time for the festival to embrace the values of the 21stcentury and allow female members to join squads as places become available. “We are not asking for 50:50 male to female ratios in squads but we would like to see the Lerwick UHA committee give directions to squads, to let squads know that there is nothing to stop them from including female members as spaces become available,” Huband said. Fellow group member Lucy Simpson, daughter of Lesley Simpson who led the South Mainland Up Helly Aa in 2015 as Shetland’s first ever female jarl, said she was sure that large numbers of girls and women would participate if given the chance, “but are maybe too afraid to be the first” because of public slander. “I would like to see Lerwick Up Helly Aa change to include lasses first of all in the Junior Up Helly Aa, and once this is established, for women to be given the opportunity to join squads or start their own, equal to men,” she said. “A huge range of people support the cause – men, women and young people. If it seems otherwise, that is only due to the public shaming that is placed on those that speak out. “A good few years ago when I was maybe 15, I spoke out during a public debate [the Althing] only to be almost brought to tears by a woman in her 40s. While acknowledging that many still “have a blind spot” when it comes to defending the gender privileges of the Lerwick UHA, they fear that public support for the festival is starting to erode while organisers continue to resist calls to modernise the festival. Anecdotal evidence suggests, they claim, that not quite as many Lerwegians have their heart in it anymore, while fewer locals and more tourists are attracted to the halls. And since the Lerwick UHA has been turned into a global event thanks to social media and live stream coverage, the continued exclusion of girls and women from the main event has been noticed by the national and international media and questions are being asked. Group members said they were united in their wish to see the various Up Helly Aas continue to go from strength to strength and would therefore like to engage with both committees to work on ideas and ways of making the festival more inclusive. The easiest way to introduce change, they say, would be by allowing girls to fully participate in JUHA. However, any attempt to communicate and engage with the committee of the Lerwick UHA has so far drawn a blank. Scott said that two “polite and respectful letters” had generated no response. “The junior committee at least wrote back,” she added. When contacted by Shetland News with requests for interview, both committees declined the invitation. Senior council representatives, meanwhile, were more than happy to discuss the SIC’s involvement in the festival. 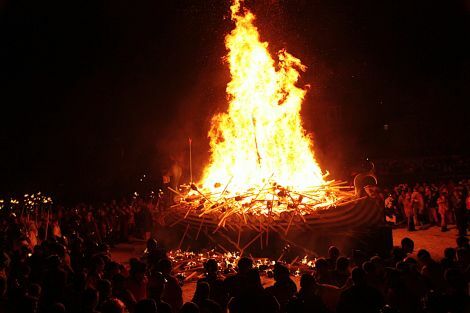 Chief executive Maggie Sandison said the Anderson High School was not involved in the organisation of the Junior Up Helly Aa anymore and that school staff had no role in the committee. The visit of the senior jarl squad to the primary schools in town had the support of the two parent councils, she said. Sandison went on to express her concern about the “quality of debate” on the issue and called on the community to have those “challenging conversations” in an atmosphere of mutual respect. “I believe in equality of opportunity for men and women in all aspects of their lives and I can also see there is much to celebrate about Lerwick Up Helly Aa too,” she said. Council convener Bell added: “As a council we don’t promote or support Up Helly Aa. I, in line with all my predecessors, host a civic reception in the town hall on the morning of Up Helly Aa. “This is in recognition of the event and the fact that the vast majority of people see it as a positive event and gain pleasure from it. It also brings a lot of positive attention to Shetland. “The cost of civic reception is fairly minimal; other aspects of council involvements such as putting up barriers and road signs is actually paid for by the committee. “I think the civic reception is appropriate but in itself doesn’t support one view or the other. As a council we are absolutely committed to equality and equality of opportunity.